Relocating to a smaller house often, unfortunately, means a smaller garden too... Here are some creative ideas about how to manage a smaller space. Small garden spaces can present challenges of their own. Whether you want to make your space look larger or just squeeze as many plants in as you possibly can, here's plenty of small gardening help. And if your small garden is in an urban setting, create a city garden your country cousins will envy. Gardening in small spaces is generally overlooked in garden design manuals. Garden design is often presented as a list of principles or rules and illustrated on a grand scale. Most of us do not have acres of land on which to carefully calculate the width versus length of our perennial borders. Many of us don’t have the time or the inclination to undertake the maintenance these acres of gardens would need. Gardening in a small space has its limits, but it need not be limiting. In a small garden, the gardener can pay attention to detail. You can keep on top of maintenance, while still having time to sit and enjoy your small garden. In fact, many small space gardens are designed around entertaining and sitting areas, rather then the need to nurture plants. Whatever your reasons for having a small garden, there is no reason it cannot be a well designed show stopper. Virtually any plant or garden style can be worked into a small garden space. The principles of good garden design still apply, but you’ll need to tweak them slightly. The entire garden can be viewed as a whole. Some small garden spaces will be able to accommodate a hidden turn around a path or even be divided into garden rooms, but for the most part, small gardens can be taken in whole, in one look. This means that, more than ever, your garden will be viewed as a composition. Limited space means you are going to have to make choices. You won’t be able to grow every plant you love. You will need to curb your inclination to buy a plant on impulse and assume you’ll find a place for it. Colour should also be limited, to give your small garden cohesion. Less is more. Cooler colours will make the garden appear larger. You can compensate for the limited colour palette with a variety of textures. The textural contrast will help blend the plant material and allow the garden to flow. Every plant or feature will need to serve a purpose. There is no room for wasted space or underperforming plants. Plants should offer at least two seasons of interest. Design can be easier when you can take in the whole picture at once. It takes fewer plants to make a dramatic effect. Gardeners get to know every space and plant in a small garden. Any plant that is out of place or not thriving can be spotted and corrected quickly. Small gardens lend themselves to being enclosed. You may not want to install a stone wall, but an evergreen or flowering hedge will give the illusion of a secret garden. 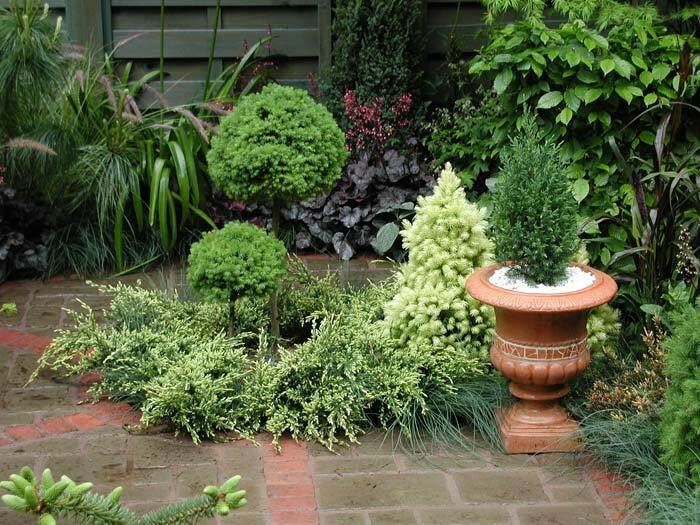 A simple low boxwood edge transforms a small garden into a formal garden. Fencing encloses and defines a space for entertaining or children’s play. A small space garden lends itself to personal expression. Smaller gardens are extensions of your home and speak volumes about the sensibilities and tastes of the gardener. And if those tastes and sensibilities should change, it’s much easier to rework a small garden. Small gardens are intimate spaces. Although the viewer can often take in the entire garden at once, that doesn't mean a small garden is without interest or variety. Too often garden designers focus on trying to make the small space seem bigger, rather than exploiting the unique charm of the given space. The gardeners who created the examples gardens shown here, have showcased various ways a gardener can make the most of their own small space garden. Hopefully you now have some idea of what you expect from your new garden. Even if you are still fantasizing or panicking, answering the questions in the last lesson should have made your focus a bit narrower. Even so, when it comes time to put a garden plan on paper, many novice garden designers feel like they don’t know where to begin. A good site evaluation will answer many of the remaining questions about the ‘hows’ and ‘whys’ of your new garden. An important early step is to assess your future garden site’s physical attributes: sun exposure, soil, nearby features... Take an honest survey of your site using site evaluation sheet and use that knowledge to begin fine-tuning your garden design. When designing a garden, it may be tempting to jump right in and start choosing plants you love. But time spent evaluating your garden site will make designing your garden that much easier. Not all plants will be happy in your garden and it’s best to know that before you start. Take some time to carefully consider and complete the Garden Site Evaluation before you begin to think about plants or styles. There is no point fighting for a garden woodland if you have full sun exposure: Not many flowering plants will flourish in a garden site under a tree. If you’re growing vegetables, you’ll want the best location for sun exposure and proximity to a water supply. And so on. If you know your site’s pluses and limitations, you can start to flesh out the garden’s possibilities. This is all the more important in a small space garden. Space limitations can be very confining or very freeing. If you’ve always dreamed of a cutting garden to fill the rooms in your home with fresh bouquets, a small garden may not satisfy that dream. However, if you know you can only accommodate about 5 types of plants or you know you don’t have room for space hogs like rapidly spreading Monarda or long, Vining pumpkins, half your work is done for you. WikiHow provides a series of easy to follow guides to doing those jobs you used to leave to your partner. Whether that is cooking, DIY, buying a car or managing the household finances. Heyho, heyho, it’s off to work we go!